Just a couple of country kids. A love that's country song worthy. with a natural, back road photo shoot. That goofy in love stage. Not many keep that feeling alive, but Brad and Melissa act like they’re still 2 young kids on one of their first dates, and it’s adorable to photograph. They wanted to keep it simple, and true to who they are. They told me of the stories of when they first met and how they didn’t have a lot of money so they spent a lot of time on the back roads. They would buy a case of beer, fill up the cooler, head out, fish, cruise, and just enjoy each other. It was so low key and sweet to recreate that. And of course the beers were real, because, I mean, we’re going 100% authentic here! Watching Melissa stick her tongue out at Brad and Brad scoopher up in his arms and spin her in the middle of the dusty road as the sun set off in the distance, it was super easy to capture that emotion of love because it was so obviously still alive in them! And then to celebrate we cracked a cold one open in the middle of the studio driveway afterwards. Perfect way to end the night. 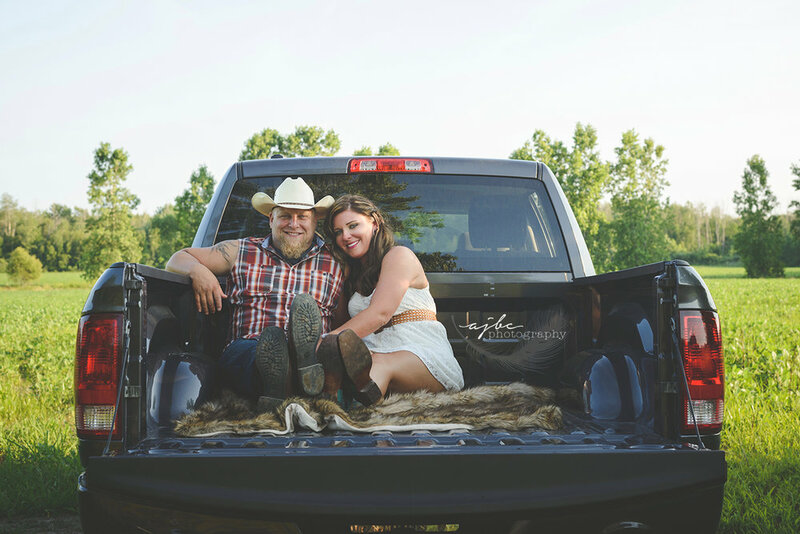 If you like this country feel check out this Zack and Jens winter engagement session! For more outdoor lovers check out Chris & Becca's photoshoot!